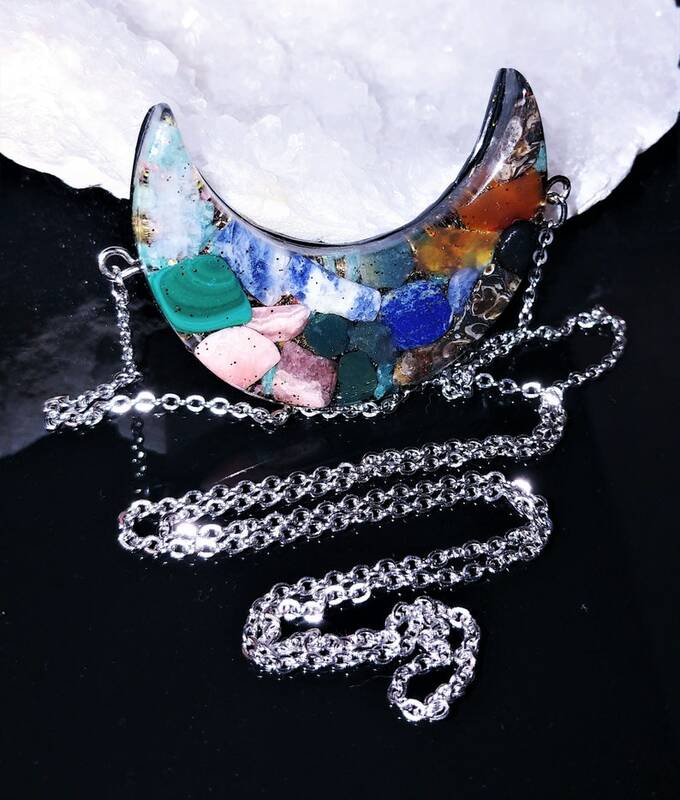 It contains Malachite, Lapis Lazuli, Sodalite, Carnelian, Moss Agate, Amazonite, Moonstone, Turritella Agate, Lodestone, Rhodochrosite, Clear Quartz crystal powder, Rose Petals, Sage, Mica Flakes, copper flakes, Metal shavings, Copper coil, Black Sun Iron Oxide nano powder, jewelry grade epoxy resin. All the crystals in the pendant above were cleared in ocean water (Florida, Miami), charged in the Sun light. All the crystals were embedded in the resin and were programmed to bring love, happiness, success and light into the life of the wearer, - I have done it before the resin hardened, so the charge will remain, and will work for your good. The pendant was treated to vibration of Love and Light ~ 528 hz~ while curing. The pendant is sanded, shaped and polished by hand, giving the surface a glossy, and smooth finish - sanding is a special process that I treat like a ceremony - I am learning about the energy of each Orgone device and enhance it with Love vibration as I polish them. Every step of its creation involves Love and Light that I put in it. Thank you for the beautiful creation. They look lovely worn. So comfotable yet so elegant. So beautifully packaged.